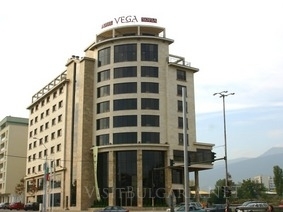 Location: Hotel "Vega Sofia" is situated in the south-east part of Sofia at the corner of "D-r G.M.Dimitrov" Blvd., "Academic Stefan Mladenov" Blvd. and "Nikola Gabrovski" Blvd., in closest vicinity of the diplomatic area of the city. Using major boulevards, it is easy to get to the city centre for approx. 10-15 min. At the same time the hotel is approximately 15 min. away from the Airport. The Central Railway and Bus stations are approximately 12 km away. Accomodation: The 9-floor building of the hotel offers disposes of 77 rooms and suites. The rooms are classic and superior with king size or twin beds, non-smoking rooms, a room for disabled and mountain view rooms. The suites are business or large corner suites. In the rooms there is internet accsess, air-conditioning, direct telephone line, safety deposit boxes, electronic lock systems, satelite television, mini-bar and bathrooms with bathtub and hairdryer. Wine & Dine: In the "Stara Sofia" ("The Old Sofia") Restaurant menu always reflects the very best of the season. Vegetarian and healthy food as well as typical Bulgarian and Mediterrenean specialties have their special place in the menu. Window tables with a beautiful view to Vitosha Mountain is another benefit of the main restaurant. Shining daylight through panorama windows and the charm of night lights of Sofia makes you feel good in the sophisticated atmosphere of the Lobby Bar. The Lobby Bar also offers a variety of pipes and cigar setting and you are always welcome to “Aroma Club”. The Wine Cellar is a unique place where connoisseurs will find special collectible reserves. In a typical atmosphere you will enjoy an exceptional selection of a superb wine list. Sport & Leisure: The sports and recreation center has a well equipped gym with professional fitness instructors. Sauna, steam bath and Jacuzzi available. Special massage programs are also offered and one can get a healthy looking tan at the "Tanning" studio. The hotel has a modernly equipped hair salon "Capelli Brillianti" and a cosmetic studio. Accomplished experts take care of their customer’s good looks.